Through an R rated lens, Kreischer tells stories of family, friendship and bumbling through daily life even if one doesn't know how to do so. His trademark, shirtless performance is coupled with an energy that many comedians don't possess, moving about the stage and looking completely flabbergasted by the stories he is telling - whether it be the only time he made his father laugh, or his completely disbelief at the antics of his children. Kreischer seemed along for the ride with the audience as he tried to understand just as they did how these events fell in to place. The show had a particularly adult bent, constantly dropping grown up language and themes that reminded me of unfiltered performers such as Carlin, but with his own childish glee added in to bring the intensity up a level. However, it was not a torrent of potty humor and curse words, there was a genuine intelligence to his shows. Jokes that did not seem to land near the start were weaved back into the narrative later in the special only to leave the audience roaring with laughter. Though the first five to ten minutes may have felt a bit rocky, as the show progressed I found myself laughing more and more, to the point where I had to catch my breath and wipe tears from my eyes. 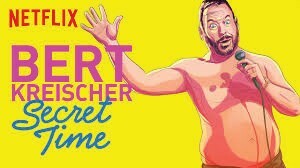 Kreischer seemed to be having incredible fun with his expert comedic performance, laughing nearly the whole set, and yet the audience was always laughing along with him. While I would certainly not recommend that you watch this with the kids, if you have time to watch it with a friend or even on your own I'd highly recommend it to any fan of raunchy comedy. This new special can be found exclusively on Netflix.